The Vizio S4221w-C4 wins our award for Best Soundbar under $300 for delivering superior surround-sound audio for everything from whispered dialogue to powerful bass. Today’s inch-thick TVs simply have no room for engineers to put in good speakers. If you want good sound when you’re watching TV, you’ve got to add an external audio system. Fortunately, there’s an easy fix: the soundbar. A soundbar is a long, slim speaker with amplifiers and surround-sound processing built in, usually accompanied by a wireless subwoofer to pump up the bass. Place a soundbar above, below or in front of your TV, and the subwoofer wherever you can fit it, then plug in a cable or two, and you get a nearly instant sonic upgrade. Most soundbars cost less than $300, but it’s hard to find stores that demo them. So how do you know which one’s the best? My pick? The Vizio S4221w-C4 coming in at $249. At a time when other companies are slimming their soundbars down to less than 2 inches thick, Vizio’s S4221w-C4 looks pretty porky at 3¼ inches. The no-frills styling looks like it was done by and for engineers. But what’s special about this soundbar is the sound. I’ve been listening to the S4221w-C4 in my home for the last week and have been blown away by the sound quality it delivers for $249. Dialogue in movies and TV shows sounds extremely clear and natural. Even without the SRS TruSurround surround-sound mode activated, it was as if there were surround speakers on the sides of my room. The subwoofer delivered surprisingly powerful and punchy bass, a very different and far superior experience than I’ve had with the boomy-sounding subwoofers included with most soundbars. The overall experience was very much like have a full surround-sound system – and that’s even before I made any adjustments to it. I thought it sounded nice with music, too: Loud enough for parties, yet refined enough even for more delicate genres like folk and classical. CNET hasn’t reviewed the S4221w-C4, but liked the S4251w-B4, its more sophisticated brother. However, the S4251w-B4 requires you to set up two extra surround-sound speakers. That’ll give you better sound, but it makes the setup more complicated. With a few exceptions, it’s hard to knock the S4221w-C4 on features. It has Bluetooth wireless, so you can stream sound from your smartphone, tablet or computer. The sleek remote has a built-in alphanumeric display, so it’s much easier to make adjustments than it is with soundbars that have only blinking lights to tell you what’s going on. The S4221w-C4 can also accept the volume up, volume down, and mute commands from your TV remote, so the soundbar will work almost like it’s part of your TV. You’ll still have to remember to turn the soundbar on and off, though. What does the S4221w-C4 lack? Mainly, an HDMI connection. HDMI is the standard connector for TVs, cable and satellite boxes, most videogame consoles, Internet streaming boxes and Blu-ray players. Instead, the S4221w-C4 uses an optical (Toslink or Coaxial) or analog (RCA or stereo mini jack) audio connector. In many cases, the HDMI connection will make the TV and soundbar work completely in sync, using just the TV’s remote for control. However, unless the soundbar has multiple HDMI inputs (the ones in this price range generally don’t) HDMI doesn’t offer such a big advantage. 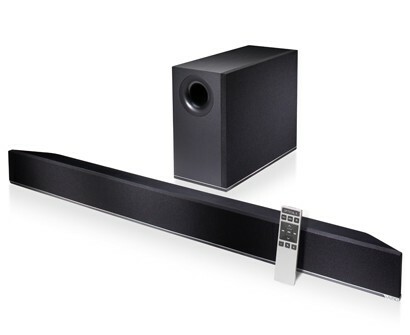 The S4221w-C4 is also tall enough to block a TV’s infrared sensor if the soundbar is placed in front of the TV and the TV’s infrared sensor is mounted low (many are). The infrared light signals from the remote control may be blocked, possibly requiring you to hold the remote way up high to get it to work. Although I prefer the sound (and the simpler remote control) of the Vizio S4221w-C4, the Sony HT-CT260 also sounds very good, just not quite as robust and powerful. CNET loved the HT-CT260’s combination of sound quality and features, and PCMag.com gave it an Editor’s Choice award. What’s the HT-CT260 got that the Vizio doesn’t? The new CT-260H version adds an HDMI input. CNET didn’t review the “H” version and I haven’t heard it, but Sony says that beyond the added HDMI input, it’s the same product. The HT-CT260 (both the regular and “H” versions) also has an infrared repeater in back. The advantage of this feature is that it assures the soundbar won’t block operation of your TV’s infrared remote control, as can be the case with the S4221w-C4. The HT-CT260 picks up these signals from your TV remote and sends them out again through a flasher on the back of the soundbar. So, those of you who can’t tell the big difference (oh, yah, I went and listened to these two and more at the stores when I was looking) - try something maybe “off brand”... I’m happy with my $190 sitting in my pocket!!! That’s a lot of months of Netflix streaming for me!!!! Sorry, but sometimes it’s nice to see items under $75!!! Maybe reviews on those??? The 5.1 Vizio soundbar (S4251w-B4) is NOT more complicated to setup (unless you think plugging in 2 RCA cords between the subwoofer and each satellite is challenging). Teh sub and bar are already matched—simply plug and play! The S4251w-B4 not only has FANTASTIC 5.1 sound, but also allows bluetooth devices to play through very well! Works great with my iPhone. I just replaced my 8-year old clunky Onkyo receiver based 6 speaker (with sub) home theater system with the S4251w-B4and it is incredible. Perfect for the spousal acceptance factor! The stereo cabinet that housed this is going into the trash tomorrow. Spend the extra $50 (MSRP) and get 5.1 surround! Hi, Craig. Yes, the extra connections for the 5.1 Vizio soundbar are not complicated. But for a lot of people, having to put surround speakers in the back of the room is a deal-breaker. For someone like you, coming off a full surround-sound system, it’s no big deal. But the fact is, most people don’t have surround speakers and don’t want them. That’s a big part of why soundbars have displaced home theater in a box systems. It was always a “dirty little secret” of the home theater industry that most of the people who bought surround-sound receivers didn’t hook up the surround speakers. I don’t know the current figures on that, but back in the late 1990s, a receiver manufacturer told me only about 20% of his customers were using surround speakers. Hi Brent - that’s great that you were able to review 48 different sound bars - but did you consider looking at non TV based brands? Yamaha, Klipsch, & JBL for example are very reputable audio brands that make similar 5.1 home theater sound systems. For example Yamaha NS-SP1800BL is a 5.1 system that’s half the price, and it has an HDMI connection which you said lack thereof is a big flaw for the Vizio sound bar. The other problem is that Vizio and other TV brands don’t share important metrics like the nominal operating power wattage of their sound bars. It seems that getting a sound system from a dedicated audio company will get us more bang for our bucks. I know a lot about how these products are developed and manufactured, and I can tell you it’s unwise to assume the ones from well-known speaker companies are better. They’re all made in China, anyway, and models offered under well-known brands made well be made by a Chinese ODM you’ve never heard of. Also, the specs on soundbars are pure nonsense, determined much more by marketing needs than by legitimate tests done to accepted standards. What matters is how demanding and skilled the product manager is on the voicing of the product. Does the product manager - at Samsung, Vizio, JBL, or wherever - have the skill and dedication to achieve a good voicing from a plastic enclosure packed with low-cost drivers? Does he or she have the political skill get the design past the accountants without having to strip cost by eliminating crossover components, reducing amp power, etc.? JBL has made some of the best speakers ever created, and some of the worst iPod docks ever created. Did you get a chance to pit it against Pioneer's SP-SB23W? Also, is there any difference between the two Vizio sound bars, S4221W-C4 and S4221W-B4, if I do not connect the rear surround speakers on the latter? We reached out to a Vizio spokesperson to confirm that the soundbar and subwoofer specs on the S4221W-C4 and S4251W-B4 are the same. The only difference is the latter model has the rear surround speakers. I have seen a lot of complaints about the 5.1 version of this being difficult to find a comfortable volume on, due to the very large volume increments. Do you recall this being an issue with this model? Thanks a lot. I have a Samsung 65 inch 6350. Trying to decide between the vizio S4221w-C4 or the Samsung H550za. both sound good to me. but was wondering which would link up better with my TV.